Cervical strain (ICD-9 847.0) is a common injury routinely seen in the ED. Frequently the result of trauma from falls or motor vehicle accidents (MVAs), this condition causes much distress to patients but, with appropriate management, it usually has few long-term sequelae. High-speed injury mechanisms have brought the common term whiplash into use to describe these injuries as well as the more inclusive whiplash-associated disorders (WAD) that has been used in the medical literature. See the images below. 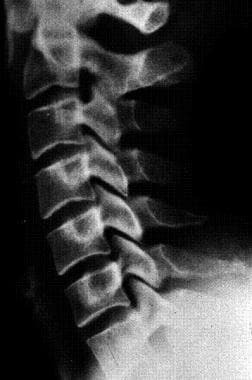 Radiograph of the cervical spine shows a normal lordotic curve. 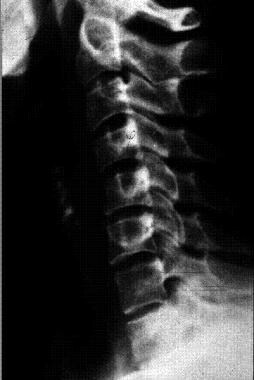 Radiograph of the cervical spine shows straightening of the lordotic curve. The chief diagnostic challenge in the emergent or urgent setting is to differentiate cervical strain from other causes of neck pain that may result in morbidity or mortality to the patient. Over a longer term, management is focused on a patient's return to daily functioning with accommodation for occupational and lifestyle issues. A cervical strain is chiefly the result of a stretch injury to the muscular and ligamentous elements of the cervical spine, although some compressive forces can be involved as well depending on the exact mechanism of injury. Such injury can occur acutely, as in a MVA, or the injury can occur over time; repetitive stress injuries to the cervical spine are common and can be difficult to differentiate from other myofascial syndromes affecting the cervical and upper thoracic region. Additionally, a significant number of injuries to the cervical spine can result from abnormal posture. Such injuries can result from occupational situations that result in odd positioning of the neck to overnight sleep positioning related injuries. Lateral view of the muscles of the neck. Cervical strain is very common with as many as one million cases per year from high-velocity (whiplash type) injuries alone. Throughout the developed and undeveloped world, low-speed trauma to the cervical spine is very common. High-speed trauma is, as with the United States, very high in incidence as well. Mortality is not an issue in this musculoskeletal disease. Morbidity from long-term injury can be significant such as when pain leads to disuse, resulting in loss of function. Significant impediment of occupational functioning exists as a result of cervical spine injuries. Typically, adults are more commonly affected than children. MVA injury mechanisms more commonly affect adults because of differences in safety requirements and in seat fit (ie, child safety seats generally provide better support of the cervical spine than typical automobile seats). Occupational cervical spine injuries are common and can afflict not only individuals involved in physical labor but also people in primarily desk or office positions. Modern office conditions and ergonomics can have significant impacts on susceptibility. Spitzer WO, Skovron ML, Salmi LR, et al. Scientific monograph of the Quebec Task Force on Whiplash-Associated Disorders: redefining "whiplash" and its management. Spine. 1995 Apr 15. 20(8 Suppl):1S-73S. [Medline]. Conforti M, Fachinetti GP. High power laser therapy treatment compared to simple segmental physical rehabilitation in whiplash injuries (1° and 2° grade of the Quebec Task Force classification) involving muscles and ligaments. Muscles Ligaments Tendons J. 2013 Apr. 3(2):106-11. [Medline]. [Full Text]. Blackmore CC, Mann FA, Wilson AJ. Helical CT in the primary trauma evaluation of the cervical spine: an evidence-based approach. Skeletal Radiol. 2000 Nov. 29(11):632-9. [Medline]. Grogan EL, Morris JA Jr, Dittus RS, et al. Cervical spine evaluation in urban trauma centers: lowering institutional costs and complications through helical CT scan. J Am Coll Surg. 2005 Feb. 200(2):160-5. [Medline]. Resnick S, Inaba K, Karamanos E, Pham M, Byerly S, Talving P, et al. Clinical relevance of magnetic resonance imaging in cervical spine clearance: a prospective study. JAMA Surg. 2014 Sep. 149 (9):934-9. [Medline]. Grunau BE, Dibski D, Hall J. The daunting task of "clearing" the cervical spine. CJEM. 2012 May. 14 (3):187-92. [Medline]. Khwaja SM, Minnerop M, Singer AJ. Comparison of ibuprofen, cyclobenzaprine or both in patients with acute cervical strain: a randomized controlled trial. CJEM. 2010 Jan. 12(1):39-44. [Medline]. Frohna WJ. Emergency department evaluation and treatment of the neck and cervical spine injuries. Emerg Med Clin North Am. 1999 Nov. 17(4):739-91, v. [Medline]. Wiangkham T, Duda J, Haque S, Madi M, Rushton A. The Effectiveness of Conservative Management for Acute Whiplash Associated Disorder (WAD) II: A Systematic Review and Meta-Analysis of Randomised Controlled Trials. PLoS One. 2015. 10 (7):e0133415. [Medline]. Borchgrevink GE, Kaasa A, McDonagh D, Stiles TC, Haraldseth O, Lereim I. Acute treatment of whiplash neck sprain injuries. A randomized trial of treatment during the first 14 days after a car accident. Spine. 1998 Jan 1. 23(1):25-31. [Medline]. Kongsted A, Qerama E, Kasch H, et al. Neck collar, "act-as-usual" or active mobilization for whiplash injury? A randomized parallel-group trial. Spine. 2007 Mar 15. 32(6):618-26. [Medline]. Pape E, Hagen KB, Brox JI, Natvig B, Schirmer H. Early multidisciplinary evaluation and advice was ineffective for whiplash-associated disorders. Eur J Pain. 2009 Jan 30. [Medline]. Patel KC, Gross A, Graham N, Goldsmith CH, Ezzo J, Morien A, et al. Massage for mechanical neck disorders. Cochrane Database Syst Rev. 2012 Sep 12. 9:CD004871. [Medline]. Durall CJ. Therapeutic exercise for athletes with nonspecific neck pain: a current concepts review. Sports Health. 2012 Jul. 4(4):293-301. [Medline]. [Full Text]. Brose SW, Jennings DC, Kwok J, Stuart CL, O'Connell SM, Pauli HA, et al. 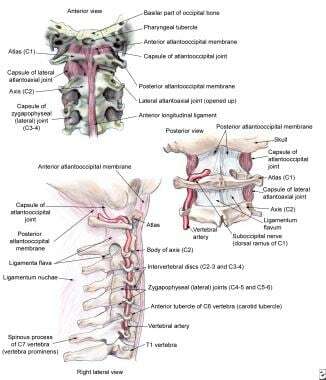 Sham manual medicine protocol for cervical strain-counterstrain research. PM R. 2013 May. 5(5):400-7. [Medline]. Klein R, Bareis A, Schneider A, Linde K. Strain-counterstrain to treat restrictions of the mobility of the cervical spine in patients with neck pain: a sham-controlled randomized trial. Complement Ther Med. 2013 Feb. 21(1):1-7. [Medline]. Myrtveit SM, Skogen JC, Petrie KJ, Wilhelmsen I, Wenzel HG, Sivertsen B. Factors Related to Non-recovery from Whiplash. The Nord-Trøndelag Health Study (HUNT). Int J Behav Med. 2013 Sep 19. [Medline]. Nieto R, Miró J, Huguet A. Pain-Related Fear of Movement and Catastrophizing in Whiplash-Associated Disorders. Rehabil Psychol. 2013 Sep 16. [Medline]. Beazell JR, Magrum EM. Rehabilitation of head and neck injuries in the athlete. Clin Sports Med. 2003 Jul. 22(3):523-57. [Medline]. Bourbeau R, Desjardins D, Maag U, Laberge-Nadeau C. Neck injuries among belted and unbelted occupants of the front seat of cars. J Trauma. 1993 Nov. 35(5):794-9. [Medline]. Bylund PO, Bjornstig U. Sick leave and disability pension among passenger car occupants injured in urban traffic. Spine. 1998 May 1. 23(9):1023-8. [Medline]. Calliet R. Neck and Arm Pain. 2nd ed. FA Davis Co; 1981. Daffner RH. Controversies in cervical spine imaging in trauma patients. Emerg Radiol. 2004 Aug. 11(1):2-8. [Medline]. Davis CG. Injury threshold: whiplash-associated disorders. J Manipulative Physiol Ther. 2000 Jul-Aug. 23(6):420-7. [Medline]. Dickinson G, Stiell IG, Schull M, et al. Retrospective application of the NEXUS low-risk criteria for cervical spine radiography in Canadian emergency departments. Ann Emerg Med. 2004 Apr. 43(4):507-14. [Medline]. Dreyer SJ, Boden SD. Laboratory evaluation in neck pain. Phys Med Rehabil Clin N Am. 2003 Aug. 14(3):589-604. [Medline]. Galasko CSB, Murray P, Stephenson W. Incidence of whiplash-associated disorder. BCMJ. Jun 2002. 44(5):237-240. [Full Text]. Griffiths HJ, Olson PN, Everson LI, Winemiller M. Hyperextension strain or "whiplash" injuries to the cervical spine. Skeletal Radiol. 1995 May. 24(4):263-6. [Medline]. Hoffman JR, Schriger DL, Mower W, Luo JS, Zucker M. Low-risk criteria for cervical-spine radiography in blunt trauma: a prospective study. Ann Emerg Med. 1992 Dec. 21(12):1454-60. [Medline]. Kappler RE. Cervical Spine. Ward RC, et al, eds. Foundations for Osteopathic Medicine. Lippincott, Williams & Wilkins; 1997. 541-546. Ladig D, DeBell LS, Hubert MK. Mosby's Complete Drug Reference 1997. Physicians GenRx. Mosby-Year Book, Inc; 1997. Martinez JA, Timberlake GA, Jones JC, et al. Factors affecting the cervical prevertebral space in the trauma patient. Am J Emerg Med. 1988 May. 6(3):268-72. [Medline]. McMorland G, Suter E. Chiropractic management of mechanical neck and low-back pain: a retrospective, outcome-based analysis. J Manipulative Physiol Ther. 2000 Jun. 23(5):307-11. [Medline]. McSwain NE, Martinez JA, Timberlake GA. Cervical Spine Trauma: Evaluation and Acute Management. 1989. Patel RV, DeLong W Jr, Vresilovic EJ. Evaluation and treatment of spinal injuries in the patient with polytrauma. Clin Orthop Relat Res. 2004 May. 43-54. [Medline]. Richards PJ. Cervical spine clearance: a review. Injury. 2005 Feb. 36(2):248-69; discussion 270. [Medline]. Shaffer MA, Doris PE. Limitation of the cross table lateral view in detecting cervical spine injuries: a retrospective analysis. Ann Emerg Med. 1981 Oct. 10(10):508-13. [Medline]. Stiell IG, Clement CM, McKnight RD, et al. The Canadian C-spine rule versus the NEXUS low-risk criteria in patients with trauma. N Engl J Med. 2003 Dec 25. 349(26):2510-8. [Medline]. Sturzenegger M, DiStefano G, Radanov BP, Schnidrig A. Presenting symptoms and signs after whiplash injury: the influence of accident mechanisms. Neurology. 1994 Apr. 44(4):688-93. [Medline]. Van Goethem JW, Maes M, Ozsarlak O, van den Hauwe L, Parizel PM. Imaging in spinal trauma. Eur Radiol. 2005 Mar. 15(3):582-90. [Medline]. Wang JC, Hatch JD, Sandhu HS, Delamarter RB. Cervical flexion and extension radiographs in acutely injured patients. Clin Orthop Relat Res. 1999 Aug. 111-6. [Medline]. Zmurko MG, Tannoury TY, Tannoury CA, Anderson DG. Cervical sprains, disc herniations, minor fractures, and other cervical injuries in the athlete. Clin Sports Med. 2003 Jul. 22(3):513-21. [Medline]. 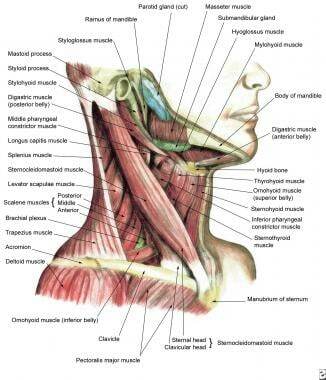 Anterior view of the muscles of the neck. The authors and editors of Medscape Reference gratefully acknowledge the contributions of previous author, Natalie T Shum, MD, to the development and writing of this article.